Was Queen Charlotte (for which Charlotteville, VA was named) descended from black people? Did she look like she was black? White men love 'em. All content © New Journal Enterprises, 2004. IT IS a common misconception that there wasn’t a black face to be seen in Camden until the Windrush docked in the late 1940s heralding the first wave of immigration from the West Indies. But Gene Adams, an art historian and curator from Belsize Park, has been researching the lives of two black residents of Camden from the 18th century, each in their way the forebears of today’s multicultural Britain. One is Dido Elizabeth Belle, a mixed race woman who spent the first 30 years of her life at Kenwood House as a member of the Earl of Mansfield’s family. The other is Olaudah Equiano, born in what is now Nigeria and bought in the West Indies as a slave. He spent the last part of his life in Fitzrovia campaigning for the abolition of slavery. His autobiography, written as he lived in Tottenham Street, played an important part in turning popular opinion against the trade and earned him lasting fame: he was placed fourth in a recent poll to find the 100 Greatest Black Britons. This year is also the United Nations’ year to commemorate the campaign against slavery, making a talk by Ms Adams to the Camden History Society on Thursday on the lives of these two figures especially timely. Ms Adams first came across Dido as she was working with the curators at Kenwood House in the early 1980s. 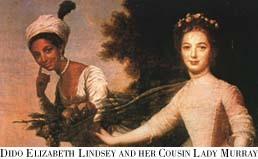 There is a portrait of Dido in the gardens at Kenwood with her half-cousin Lady Elizabeth Murray which hangs at Scone Palace in Perth – the latter girl languid and still, the former almost dashing out of the picture frame, pointing strangely to her cheek and dressed in a strange approximation of what the artist presumably took to be “ethnic” dress. In reality, Dido dressed in a similar fashion to her white companions. She was probably born in 1763, the daughter of Sir John Lindsay, a captain in the Royal Navy and the nephew of Lord Mansfield. She and her half-cousin Elizabeth were taken in as infants by Lord and Lady Mansfield – their great-uncle and aunt – and brought up at Kenwood House. Dido found herself in a nebulous social position – though she certainly was not a servant, neither was she gentry, unlike Elizabeth with whom she grew up. Contemporary accounts suggest that Dido would usually not dine with the family and their guests in the evening, instead joining the ladies for an after-dinner coffee. Dido’s role, it seems, was to be a playmate, and later a kind of personal attendant, to Elizabeth. She also ran the dairy and poultry yards at Kenwood as she got older. The household account books show her as receiving an annual allowance of £30 10s. As a comparison, the first coachman received £15 9s, while Elizabeth received around £100. Elizabeth married and left Kenwood when both women were 20. Dido was to remain at Kenwood a further 10 years. It’s not clear what became of Dido after she left Kenwood, although bank records showing a name change from Belle to Davinier suggest she married. It seems Dido cemented whatever anti-slavery feelings Lord Mansfield already possessed, and he used his position as a distinguished judge to condemn the trade. Olaudah Equiano’s life was far more difficult than that of Dido, and his influence on the demise of slavery was far more direct. His autobiography, The Interesting Narrative of the Life of Olaudah Equiano, or Gustavus Vassa, the African (1789), does not survive synopsis too well. The bare facts of his life are as follows: as a child, he was marched to the coast and was “tight-packed” on board a slave ship in conditions he describes as “pestilential”. It is his account that remains the most forceful of condemnations of the Atlantic slave trade. “The shrieks of the women, and the groans of the dying, rendered the whole a scene of horror almost inconceivable,” he writes in one famous passage. Around the age of 10, Equiano was bought by Michael Pascal, an officer of the Royal Navy. This presented opportunities he might have otherwise been denied had he become a mere plantation slave. Brought to London, he was given as a “present” to two of Pascal’s cousins. While in London, Equiano learned to read and write. He became skilled enough – and consequently valuable enough – to be rewarded a position with a small income attached, and he soon saved up enough to buy his freedom, for a price set at £40. He worked his way up the hierarchy of the merchant navy before becoming the commissary of provisions of stores, thus making him probably the first black civil servant in this country. Equiano died in March 1797, 40 years before the abolition of slavery in Britain. Though he was not around to see for himself the repercussions his book would have, he was in the unusual position for a former slave of being able to bequeath to his daughter a sizeable estate of £950 – worth around £80,000 today. n Gene Adams’ essay on the life of Olaudah Equiano will appear in a future edition of the Camden History Review. Further reading: The History of the Atlantic Slave Trade by Hugh Thomas, Simon and Schuster, 1997; The Black Diaspora by Ronald Segal, Faber and Faber, 1995; Islam’s Black Slaves by Ronald Segal Atlantic Books, 2001; Slave by Mende Nazer and Damien Lewis, Virago 2004.